We invited attendees at the Corporate Researchers Conference this fall to play with LEGO® bricks in response to a research question and watched their creative juices flow. They enjoyed building models with their hands while uncovering new insights into their own relationship to their research. This directed play moved professional researchers into imagining themselves in future scenarios using an innovative approach, PlayFULL Insights, which unlocks System 3 (Prospective) thinking. Through play they expressed their aspirations for the future and provided examples of PlayFull applications for consumer research and other problem solving. 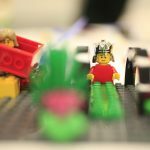 Spoiler alert: PlayFULL Insights® is a qualitative method where participants use LEGO® bricks to build stories in response to carefully-crafted questions working towards faster and greater understanding of key research needs. The models created become tangible representations of people’s thoughts; the stories they tell provide insight into their memories and imaginations and the complex nuances of their prospective thinking. Please join us on Thursday, January 10, at 2:00 pm ET, for a webinar which will have you thinking about the future and imagining how you might glean consumer insights in an entirely new manner. Presented by: Karen Lynch, Sr. Director, Qualitative Insights. Why is an understanding of Prospective, or System 3, thinking important? As behavioral researchers, we not only seek to understand consumer behavior, we strive to understanding the thought processes behind exhibited behaviors. We seek insights into these thought processes so that we can influence them—to encourage consumers to continue with a particular behavior (maintaining their status as core users) or change a behavior (ultimately increasing usage and/or adopting use of a product or service). Cognitive psychologists, most notably Nobel Memorial Prize-winning author Daniel Kahneman, raised our awareness of the dichotomy between modes of thought: System 1 vs. System 2, fast vs. slow, or implicit vs. explicit thinking. System 3 thinking has been uncovered in more recent work from those studying modes of decision-making thought processes: Prospection, or the generation and evaluation of mental representations of possible future, is not simply fast or slow… it is something else working in tandem with those thought processes. And by digging into this third mode of thinking, we can overcome business challenges ranging from marketing and messaging strategies to new brand positioning and planning. Please join us on Thursday, September 13, at 2:00 pm ET, for a webinar which will have you thinking about the future and imagining how you might glean consumer insights in an entirely new manner.